Alberto di Jorio (18 July 1884 – 5 September 1979), was a cardinal of the Catholic Church and for many years along with the layman Bernardino Nogara the powerhouse behind the growing wealth of the Vatican and the Istituto per le Opere di Religione (popularly known as the "Vatican Bank"). Bernardino Nogara was the financial advisor to the Vatican between 1929 and 1954, appointed by Pope Pius XI and retained by Pope Pius XII as the first Director of the Special Administration of the Holy See. According to historian John F. Pollard, Nogara laid "the foundations" for "one of the biggest pillars for the Vatican's post-Second World War financial strength." From his earliest years di Jorio was destined for a career in the Roman Curia. He entered the most prestigious of Roman seminaries, the Pontifical Roman Seminary, and after becoming a priest in 1908 soon took up a role as an official in the vicariate of Rome. 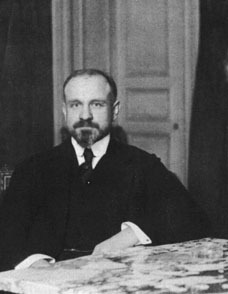 Despite doing some work as a pastor in Rome, di Jorio was always chiefly concerned with his work in the Vatican bureaucracy, and in 1918 he took up a role as president of the Istituto per le Opere di Religione ("Institute of Religious Works"). The Roman Curia comprises the administrative institutions of the Holy See and the central body through which the affairs of the Catholic Church are conducted. It acts in the Pope’s name and with his authority for the good and for the service of the particular Churches and provides the central organization for the Church to advance its objectives. Under the direction of Pope Pius XI, who was eager to settle the "Roman Question" that had kept the Pope as a "prisoner of the Vatican" since Italian unification in 1870, di Jorio formed a close association with Bernardino Nogara in the 1920s. After the Lateran Treaty settled the "Roman Question" and made the Vatican an independent state, di Jorio was chosen by Nogara to run the Vatican Bank, and aided by laws that allowed Nogara to freely buy shares in any company even if it made products contrary to Catholic Church teaching, the Vatican grew immensely wealthy, buying extensively into such wealthy corporations as General Motors, Standard Oil, General Electric and IBM – as well as Italgas, the major supplier of gas in Italy at the time. Pope Pius XI, born Ambrogio Damiano Achille Ratti, was head of the Catholic Church from 6 February 1922 to his death in 1939. 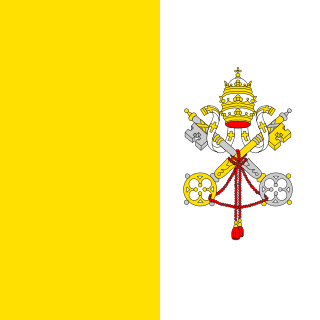 He was the first sovereign of Vatican City from its creation as an independent state on 11 February 1929. He took as his papal motto, "Pax Christi in Regno Christi," translated "The Peace of Christ in the Kingdom of Christ." Father di Jorio (later a Monsignor) continued to run the Istituto per le Opere di Religione (and did so until after Vatican II) but he also played many other roles in the Curia during these years, most notably becoming Secretary of the Sacred College of Cardinals in 1947. He was secretary of the conclave during the election of Pope John XXIII, who put his zuchetto on di Jorio's head at the end of the conclave, a traditional promise that he would make di Jorio a cardinal. Six weeks after the conclave, di Jorio was elevated to Cardinal-Deacon of S. Pudenziana in the consistory of 15 December 1958. He was later consecrated Titular Archbishop of Castra Nova on 19 April 1962 when Pope John decreed that all cardinals had to be bishops. He opted for the order of Cardinal-Priests and his deaconry was restored to title on 26 June 1967. The College of Cardinals, formerly styled the Sacred College of Cardinals, is the body of all cardinals of the Catholic Church. Its membership is 223, as of 30 January 2019. Cardinals are appointed by the Pope for life. Changes in life expectancy partly account for the increases in the size of the College. Pope John XXIII was head of the Catholic Church and sovereign of the Vatican City State from 28 October 1958 to his death in 1963; he was canonized on 27 April 2014. Angelo Giuseppe Roncalli was the fourth of fourteen children born to a family of sharecroppers who lived in a village in Lombardy. He was ordained to the priesthood on 10 August 1904 and served in a number of posts, as nuncio in France and a delegate to Bulgaria, Greece and Turkey. In a consistory on 12 January 1953 Pope Pius XII made Roncalli a cardinal as the Cardinal-Priest of Santa Prisca in addition to naming him as the Patriarch of Venice. Cardinal di Jorio participated in the Second Vatican Council and in the conclave of 1963 that elected Pope Paul VI. Although already seventy-nine at the time, he continued as effective head of the Vatican Bank until 1968. He was prohibited from participating in the two 1978 conclaves because of his age. Upon the death of José da Costa Nunes on 29 November 1976, di Jorio became the oldest member of the College of Cardinals. Pope Paul VI preached a special homily for him on the seventieth anniversary of his priestly ordination. Pope Saint Paul VI was head of the Catholic Church and sovereign of the Vatican City State from 21 June 1963 to his death in 1978. Succeeding John XXIII, he continued the Second Vatican Council which he closed in 1965, implementing its numerous reforms, and fostered improved ecumenical relations with Eastern Orthodox and Protestant churches, which resulted in many historic meetings and agreements. Montini served in the Holy See's Secretariat of State from 1922 to 1954. While in the Secretariat of State, Montini and Domenico Tardini were considered as the closest and most influential advisors of Pius XII, who in 1954 named him Archbishop of Milan, the largest Italian diocese. Montini later became the Secretary of the Italian Bishops' Conference. John XXIII elevated him to the College of Cardinals in 1958, and after the death of John XXIII, Montini was considered one of his most likely successors. DomJosé da Costa Nunes was a Portuguese Cardinal of the Roman Catholic Church who served as Bishop of Macau from 1920 to 1940, Patriarch of the East Indies from 1940 to 1953, and was elevated to the cardinalate in 1962. Giuseppe Siri was an Italian Cardinal of the Catholic Church who served as Archbishop of Genoa from 1946 to 1987, and was elevated to the cardinalate in 1953 by Pope Pius XII. Some sedevacantist groups believe a conspiracy theory known as the Siri thesis, which states that Siri was elected during the 1958 papal conclave that elected Angelo Roncalli as John XXIII. Siri never held these views and accepted the authority of John XXIII, Paul VI, John Paul I, and John Paul II. William Wakefield Baum was an American cardinal of the Catholic Church. He served as Bishop of Springfield-Cape Girardeau (1970–73) and Archbishop of Washington (1973–80) before serving in the Roman Curia as Prefect of the Congregation for Catholic Education (1980–90) and Major Penitentiary (1990–2001). He was elevated to the College of Cardinals in 1976. At the time of his 1980 appointment as Prefect of the Congregation for Catholic Education, he was the highest-ranking American ever in the Church. Cardinal Baum was the longest-serving American cardinal in history. Agostino Cacciavillan is an Italian Cardinal of the Catholic Church. He was Pro-Nuncio to Kenya, India, Nepal, and the United States between 1976 and 1998, and then served as President of the Administration of the Patrimony of the Apostolic See from 1998 to 2002. He was elevated to the cardinalate in 2001. Sergio Sebastiani is an Italian cardinal of the Roman Catholic Church and the president emeritus of Prefecture for the Economic Affairs of the Holy See. Tomáš Josef Špidlík, SJ was a Czech prelate of the Catholic Church. He was a Jesuit priest and theologian. Pope John Paul II made him a Cardinal in 2003. The Special Administration of the Holy See was a dicastery of the Roman Curia from 1929 to 1967. It was established by Pope Pius XI on 7 June 1929 to manage the ₤it. 750 million in cash and 1,000 million in Italian government bonds transferred to the Holy See in implementation of the Financial Convention attached to the Lateran Treaty of 1929. Eugène-Gabriel-Gervais-Laurent Tisserant was a French prelate and Cardinal of the Roman Catholic Church. Elevated to the cardinalate in 1936, Tisserant was a prominent and long-time member of the Roman Curia. Leo Jozef Suenens was a Belgian prelate of the Roman Catholic Church. He served as Archbishop of Mechelen-Brussel from 1961 to 1979, and was elevated to the cardinalate in 1962. Pope John Paul I died suddenly in September 1978, 33 days after his election. Following contradictory reports about the circumstances of his death and apparent anomalies about the issuing of the death certificate and other procedures, several conspiracy theories have gained currency. Pastor bonus is an apostolic constitution promulgated by Pope John Paul II on 28 June 1988. It instituted a number of reforms in the process of running the central government of the Roman Catholic Church, as article 1 states "The Roman Curia is the complex of dicasteries and institutes which help the Roman Pontiff in the exercise of his supreme pastoral office for the good and service of the whole Church and of the particular Churches. It thus strengthens the unity of the faith and the communion of the people of God and promotes the mission proper to the Church in the world". Benedetto Aloisi Masella was an Italian Cardinal of the Roman Catholic Church who served as Prefect of the Discipline of the Sacraments from 1954 to 1968, and as Chamberlain of the Roman Church from 1958 until his death. Aloisi Masella was elevated to the cardinalate in 1946 by Pope Pius XII, whom he designated to canonically crown Our Lady of Fatima. Gustavo Testa was an Italian prelate of the Catholic Church, who was made a Cardinal in 1959. He spent his career in the Roman Curia. He entered the diplomatic service of the Holy See in 1920 and held several appointments as papal nuncio from 1934 to 1959. He headed the Congregation for Oriental Churches from 1962 to 1968. Francesco Marco Nicola Monterisi is an Italian cardinal of the Catholic Church. Clemente Micara was an Italian prelate of the Catholic Church. He worked in the diplomatic service of the Holy See from 1909 to 1950 and was Vicar General of Rome from 1951 until his death. Francesco Bracci was an Italian Cardinal of the Roman Catholic Church. He served as Secretary of the Sacred Congregation for the Discipline of the Sacraments in the Roman Curia from 1935 to 1958, and was elevated to the cardinalate in 1958. Cesare Zerba was an Italian cardinal of the Roman Catholic Church. He served as Secretary of the Sacred Congregation for the Discipline of the Sacraments in the Roman Curia from 1958 to 1965, and was elevated to the cardinalate in 1965. Francesco Carpino S.T.D. was a Roman Catholic Cardinal and Archbishop of Palermo. Gabriel-Marie Garrone was a Cardinal of the Roman Catholic Church and a Prefect of the Congregation for Catholic Education. Sergio Guerri was an Italian Cardinal of the Roman Catholic Church who served as personal theologian to five popes from 1955 to 1989, and was elevated to the cardinalate in 1969. Santos Abril y Castelló is a Spanish prelate of the Roman Catholic Church. After a career in the diplomatic corps of the Holy See, he held a number of positions in the Roman Curia and from 2011 to 2016 was Archpriest of the Basilica of Santa Maria Maggiore. Yallop, David; In God's Name: An Investigation into the Murder of Pope John Paul I (Poetic Product Limited: 1984), pp. 146–16. In God's Name: An Investigation into the Murder of Pope John Paul I is a book by David A. Yallop about the death of Pope John Paul I. It was published in 1984 by Bantam Books. Pope John Paul I was head of the Catholic Church and sovereign of the Vatican City from 26 August 1978 to his death 33 days later. He was the first pope to have been born in the 20th century. His reign is among the shortest in papal history, resulting in the most recent year of three popes, the first to occur since 1605. John Paul I remains the most recent Italian-born pope, the last in a succession of such popes that started with Clement VII in 1523.